Do you go to the pool a lot? My family gets to our community pool at least 3x a week and my daughter’s hair is suffering from it. Even after we douse her hair in conditioner, it is just as knotty as can be. When I heard of ‘Ultra Swim‘ I’m pretty sure I saw a few angels descend from the heavens because it was exactly what I was looking for. We ran ALL AROUND TOWN hunting it down and after 6 attempts came across the brand and bought the lot up! Holy amazing! After one wash you can see the difference. My daughter’s baby-like hair is back. No more rat’s nest! Now – if only my neighborhood stocked enough for the summer!! That’s a whole different issue. LOL! Previous Post: « ENTER TO WIN: An American Girl Doll!!!!! Wow, my girls really need this too! We’re also at the pool constantly and its taken its toll on all our hair….ugh. Where did you eventually find it? I’m gonna check Walgreens and Target today…thanks for the great tip….as always!! You also might want to check sporting good stores. 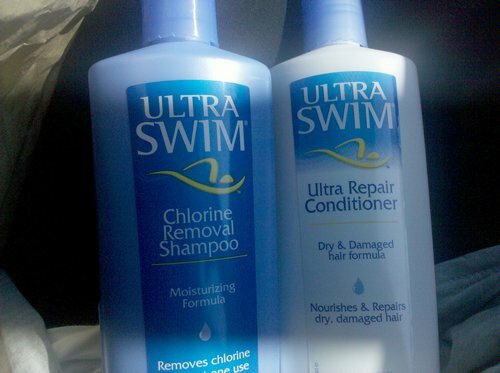 Competitive swimmers often use this product. ^^ Yep. What Amy said. I was just going to say the same thing. I’ve read that wetting it protects the hair from soaking up the chlorine. Dry hair acts like a sponge.